Ware is trying to hold off the rookie Hunt and keep his starting job. He ranked as the 19th running back out of 61 that qualified last season with a 77.2 PFF grade after posting a career high 83.6 grade in 2015 (10th of 66 halfbacks). Ware’s yards after contact per attempt were significantly higher in a part time role (78 touches) in 2015 at 3.79 than when he was the lead back (247 touches) in 2016 at 2.81. 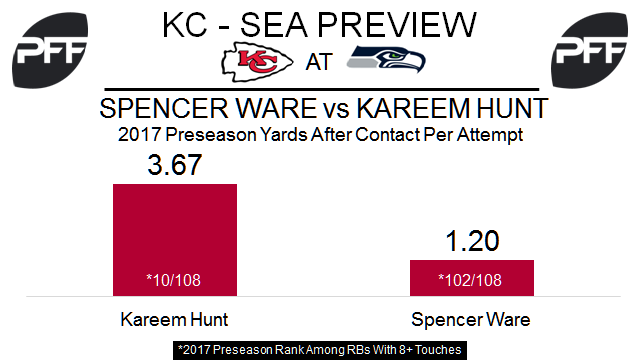 Hunt was drafted in the third round this year and has the ability to challenge Ware for playing time right away. Last year at Toledo he ranked fourth of 88 running backs with 175 or more touches in PFF elusive rating (a runner’s success beyond the point of being helped by his blockers). He forced 98 missed tackles in 302 touches, tied for the most in FBS. Parker Ehinger, LG – The Chiefs removed Ehinger from the PUP list this week, and he will begin his attempt to retake the starting left guard job from Bryan Witzmann. Ehinger played 277 snaps in 2016 before injuring his knee, and was more effective as a run blocker (77.9 run block grade) than as a pass protector (44.5 pass block grade). Earl Okine, OLB – Okine is a long shot to make the Chiefs 53-man roster, but this preseason he has showed some pass rush ability. He has two sacks and four total pressures in 22 pass-rush attempts. Okine is ranked fourth of all 3-4 outside linebackers with 20 or more pass-rush attempts in PFF pass-rush productivity (pressures created per snap with weighting toward sacks). 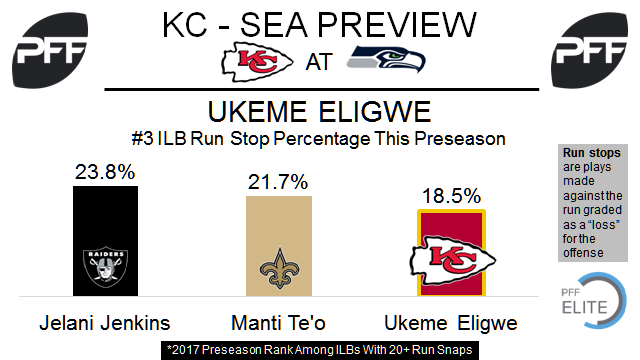 Ukeme Eligwe, ILB – The Chiefs drafted Eligwe in the fifth round this year, and he has excelled in stopping the run this preseason with five stops (plays made against the run graded as a “win” for the defense) in 27 run snaps. Of all inside linebackers with 20 or more run snaps, Eligwe is third in run stop percentage at 18.5 percent. With the loss of LT George Fant for the season, the Seahawks acquired Matt Tobin from the Eagles via trade and he will compete with Rees Odhiambo for the starting left tackle position. In his final game with the Eagles in Week 2 of the preseason, Tobin finished with an overall grade of 74.8 (31st) and a run blocking grade of 72.5. 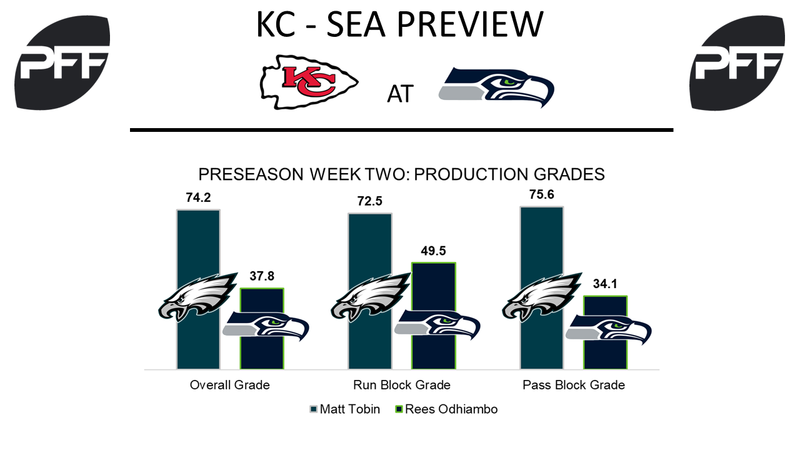 Odhiambo played at left tackle after playing right guard in the Seahawks’ opening preseason game and finished with an overall grade of 37.8 (116th) and a run blocking grade of 49.5. Currently, Tobin ranks 20th in pass blocking efficiency with 96.2 by allowing two quarterback pressures on 39 pass blocking snaps in the preseason. Odhiambo has 22 pass blocking snaps at left tackle and has allowed four quarterback pressures for a pass blocking efficiency of 85.2, which ranks 118th among 126 tackles. Delano Hill, S – Third round pick Delano Hill has seen 39 snaps this preseason and has yet to miss a tackle opportunity, while adding three stops (two run, one passing). Hill’s 77.9 overall grade against the Vikings was the highest grade earned by a Seahawks safety and 36th across NFL safeties. Tedric Thompson, S – Thompson’s 37 snaps in coverage are the 30th most among 133 other safeties and has allowed a minuscule 0.57 yards per coverage snap while adding an interception. Though he was brought in to be the center-field safety that makes plays, he has also showed his willingness to make plays in the run game with his 78.8 run defense grade against the Vikings, second on the team to All-Pro Earl Thomas. In his 14 run snaps played in the preseason, Thompson has zero missed tackles and two run stops for a stop percentage of 14.3 (seventh).